Each month as part of this series from the AAS Historical Astronomy Division, an important discovery or memorable event in the history of astronomy will be highlighted. This month, guest author Alan Hirshfeld of UMass Dartmouth focuses on Karl Jansky and the discovery of cosmic radio waves. 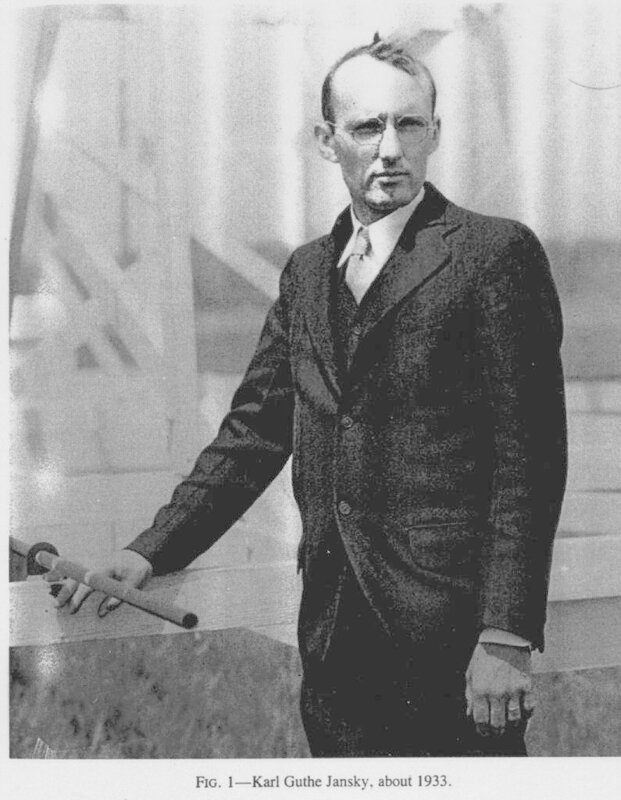 Karl Jansky, pioneer of radio astronomy, was born on the 22nd of this month in 1905 in what was then the Oklahoma Territory. He graduated in 1927 with a bachelor’s degree in physics from the University of Wisconsin, where his father Cyril was a professor of electrical engineering. After a year of graduate study, he joined Bell Telephone Laboratories and was posted to their field station in Cliffwood, New Jersey (later moved to its longtime location in Holmdel). The first “long-wave” (60 kHz) transatlantic radio telephone service had just been inaugurated between New York City and London — at $75 for 3 minutes — and Bell Labs began to explore the viability of long-distance, “short-wave” (MHz-frequency) communication. Jansky examined sources of atmospheric static that might interfere with transatlantic short-wave voice transmissions. To capture radiation at his chosen frequency of 20.5 MHz — a frequency free of domestic radio broadcasts — he built a 100-foot-long, wood-and-wire antenna, resembling a large, horizontal box kite. The entire assembly rotated on a set of Ford Model T wheels, providing it with a crude directionality. 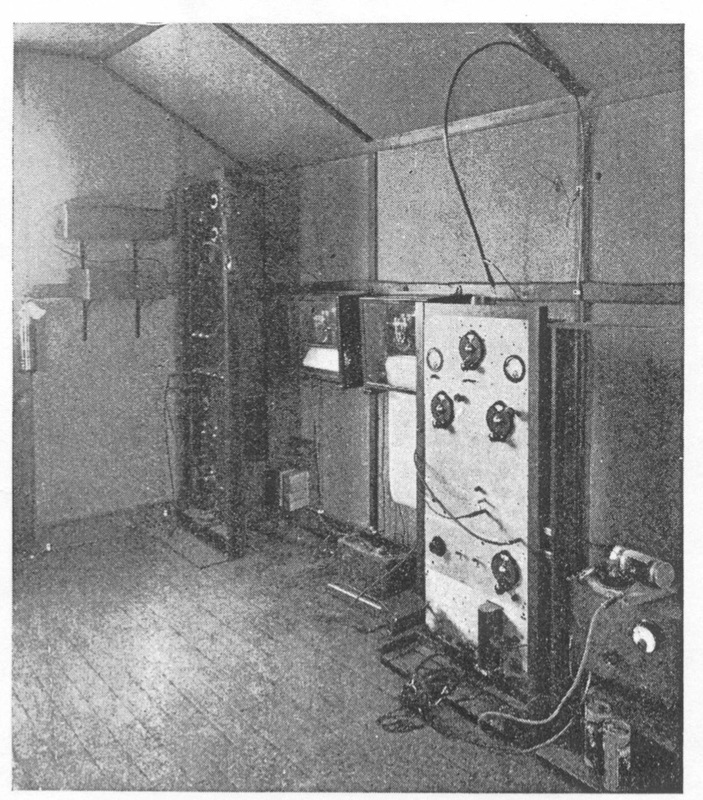 A nearby shack housed the receiver and chart recorder. The instrument easily picked up the radiation generated by thunderstorms, but also revealed a faint “hiss type static” of unknown origin that rose and fell on a daily basis. (Ref. 7) Initially, Jansky attributed the source of the noise to the Sun; however, further observation confirmed a periodicity of 23 hours and 56 minutes. In other words, the source kept track with the stars, not the Sun, and thus was situated somewhere beyond the solar system. But where? In April 1933, closing in on nearly two years of study, Jansky read his breakthrough paper, “Electrical Disturbances Apparently of Extraterrestrial Origin,” before a meeting of the International Scientific Radio Union in Washington, DC. The strongest of the extraterrestrial waves, he found, emanate from a region in Sagittarius centered around right ascension 18 hours and declination — 20 degrees — in other words, from the direction of the galactic center. Jansky’s discovery made the front page of the New York Times on 5 May 1933, and the field of radio astronomy was born. Although Jansky’s work appeared soon afterward in Popular Astronomy and Nature, there was no follow-up from the astronomical community. “The discovery was ahead of its time,” writes Anthony Tyson, former Bell Labs scientist, “because in 1933 radio waves had nothing to do with astronomy, so it really fell between radio engineering and astronomy.” (Ref. 1) Bell Labs dismissed Jansky’s subsequent idea for a 100-foot-diameter dish antenna as irrelevant to telephonic communications, and his trailblazing foray into radio astronomy ended. It would be four years later, in 1937, that engineer Grote Reber erected a radio telescope in his backyard and conducted the first systematic survey of radio emission from outer space. 4. Jansky, Karl G. 1933. “Electrical Disturbances Apparently of Extraterrestrial Origin.” Proceedings of the Institute of Radio Engineers, 21, 1387-1398. 5. Jansky, Karl G. 1933. “Electrical Phenomena that apparently are of Interstellar Origin.” Popular Astronomy, 41, 548-555. 6. Jansky, Karl G. 1933. “Radio Waves from Outside the Solar System.” Nature, 132, 66. 8. “New Radio Waves Traced to Centre of The Milky Way.” New York Times, 5 May 1933, 1. 9. Sullivan, W.T., ed. The Early Years of Radio Astronomy: Reflections Fifty Years After Jansky’s Discovery. Cambridge: Cambridge University Press, 2005.